The Yowie milk-chocolate treat has returned to Australian store shelves after a 12-year absence, with a new recipe. Nut free and gluten free with no GMO, palm oil, trans fat or high-fructose corn syrup, Yowie is ethically sourced with Rainforest Alliance certification. The Yowie is available as a ‘wildlife playmate’ collectable, produced to international quality and safety standard, and complete with an information leaflet that profiles the mythical creature reputed to live in the Australian wilderness, its eco status, habitat, food sources and threats to the species and its environment. The mission of the brand’s six “lovable” characters is to save the natural world, and each is responsible for caring for a different natural habitat. Carefully detailed to scientific specification, Yowie playmates have been designed to encourage learning through play. 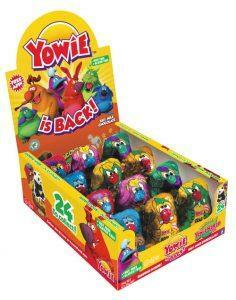 A yowie app is also available for free: download from www.yowieworld.com. Created by best-selling authors Bryce Courtenay and Geoff Pike, the six Yowie playmate characters are Rumble the Redgum Yowie, Nap the Honeygum Yowie, Squish the Fiddlewood Yowie, Crag the Mangrove Yowie, Boof the Bottlebrush Yowie and Ditty the Lillipilli Yowie. “We are thrilled to range the new and improved Yowie product from Universal Candy and look forward to introducing it to our customer base,” Mr Langstaff said.